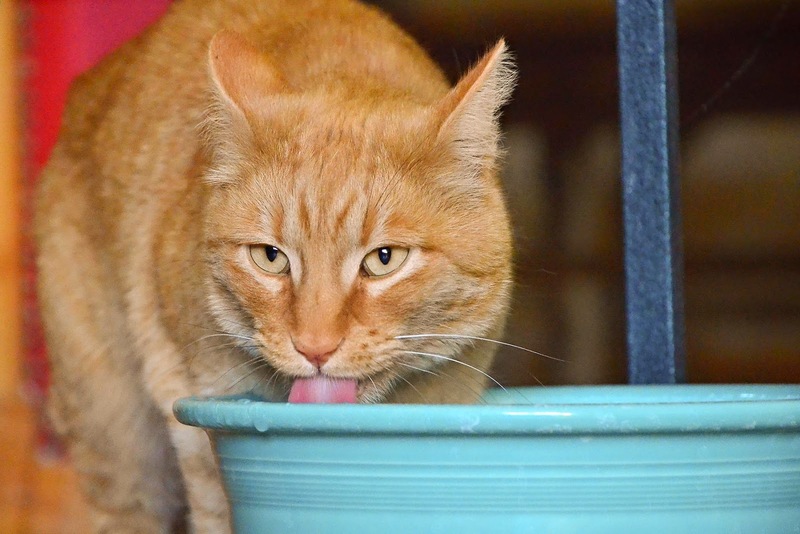 For the record, the feral beast has access to five water bowls/tubs/troughs in the barn. All of the water at the ranch comes out of the same well. The water served inside the house is the same as the water served at the barn. Try telling that to Johnny. Johnny: I like this bowl best. The color complements my features. ...and strikes a pose to show off his impressive tail. Cats are sort of discriminating - mine prefer the dog's bowl, with its debris and drool that arrives seconds after the water is changed, to their own pristine bowl - same tap, same water, used for all! Perhaps Johnny has a preference for a cool, shady spot with no dust and less bugs? ohhh ... forgot to ask, has Johnny met the new additions? (Lady Mary, Lady Edith and Mrs Hughes? Day 3 and everyone still has all their feathers. All the girls are together 24/7 now and there is harmony across the land. I like that bowl too, it's a beautiful blue and looks handmade. Cats are very picky. When I saw that headline, I was sure I would see a picture of Johnny and Smooch napping on the bed. Maybe next time. The bowl is Fiestaware. Nothing but the best for my Smooch...and Johnny. He is a beautiful animal. Cats are cats! I've never figured them out. They keep their mystery hidden. JCC's prime hunting hours are between 8 p.m. and 6 a.m. - there will be no spending the night inside! Keep reminding me of that, ok? except if the wheather conditions are too bad to leave the little fellow outside? 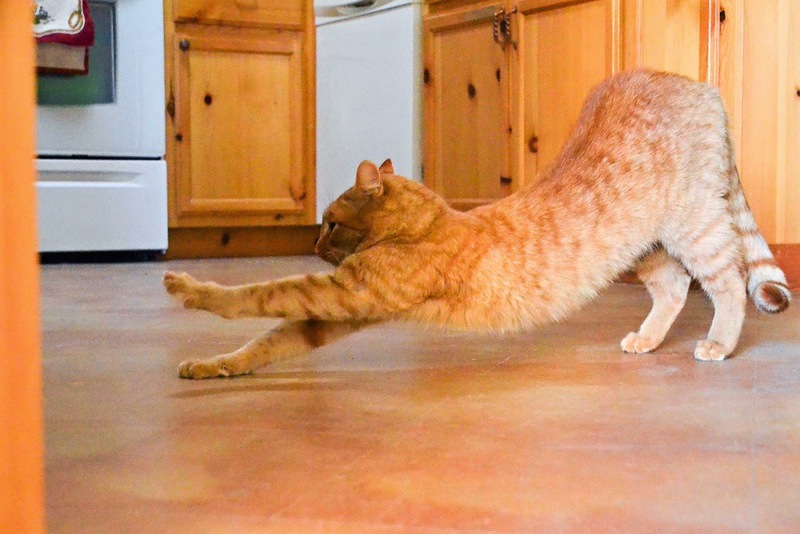 A cat doing the "downward dog". Ha! My one cat will only drink out of the bathtub faucet, or the bath water. eeww! It is a lovely thing to see the domestication of such a feral beast. 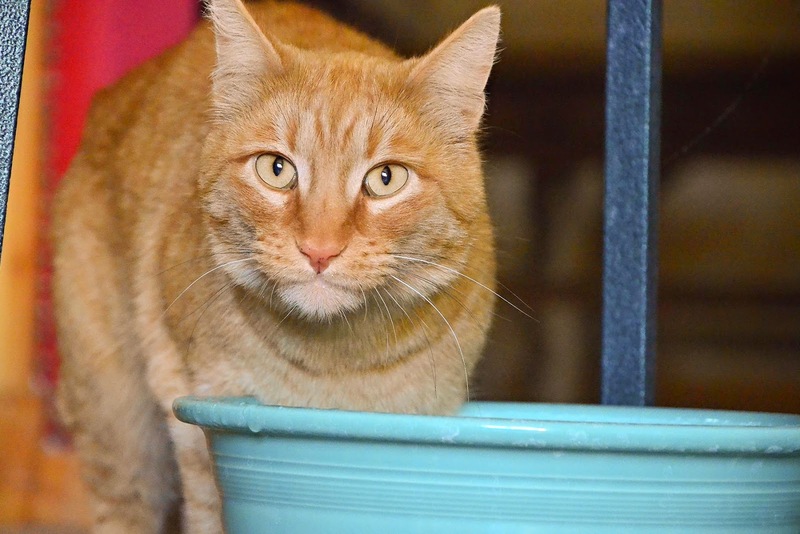 I believe in my heart of hearts that all cats are feral unless they choose to be adored. If they can train the humans and others (dogs, donkeys etc.) to succumb to their wiles then the domestication can be accomplished. I worked at a shop one time that had two feral kittens living under the building. Onyx and Jasper took only a couple of months to domesticate the staff and we ended up having shop kittys who welcomed the customers as they lounged on the desks. They never stayed in at night and were always waiting every morning for food, love and naps, in that order. Oma Linda!!! You are so right! My cat has all the people in our house trained to do his bidding. 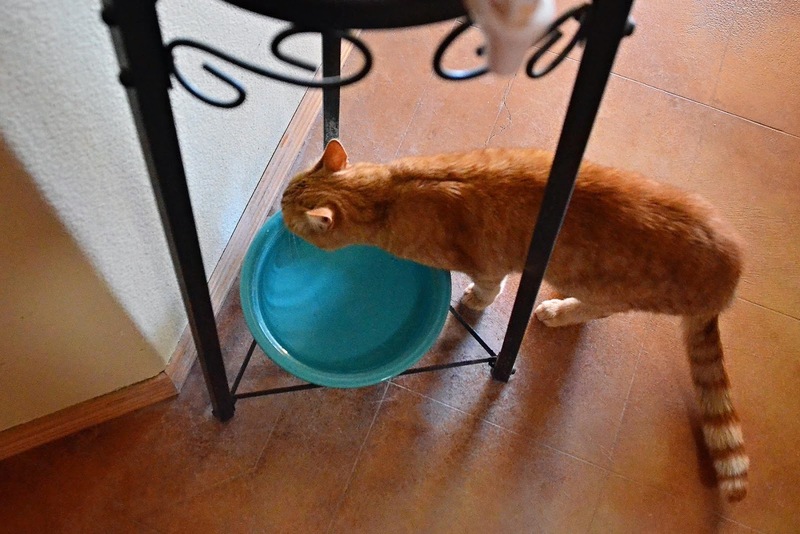 Our 17 year old cat insists on at least three water bowls throughout the house and one outside. She is very fussy that the water be fresh (i.e. put in the bowl no more than two hours earlier). She will sit by a bowl with water in it and give the humans the stink eye, until the water is changed. Johnny as usual looks very handsome and yes, the Fiestaware bowl is quite the complement to his coloring. You have the cutest cat !!! And of course the cabinets show him to perfection as well. Most impressive tail. Lovely pics of beautiful JCC. Love JCC he is such a handsome boy. Our little dog will actually lead you to her bowl and bark at you then look at the bowl until you change the water. She has trained us well. I love JohnnyCashCat....What a ham he is!!!!! He's doing it to tick off Smooch, plain and simple. Bad kitty! how exciting to drink from a bowl that belongs to another critter! or maybe yours! the water temp may also be different. 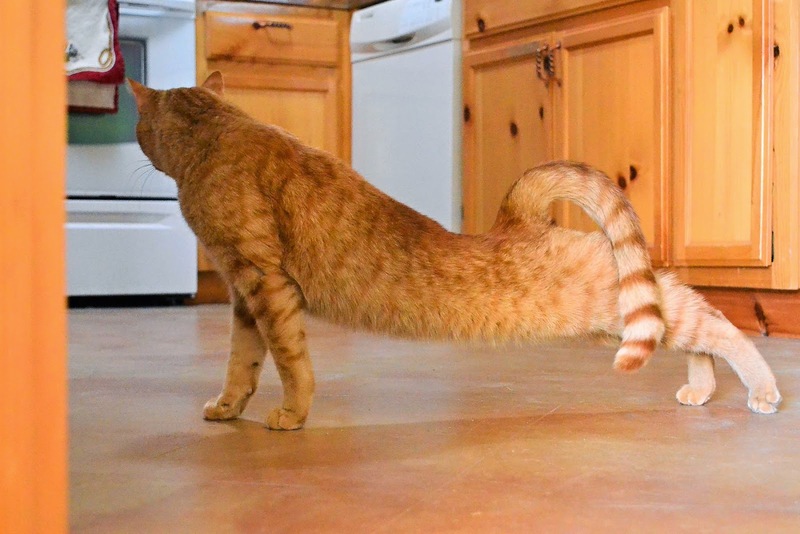 such a long and slim cat, I am surprised how slim he remains with all the good food you feed him. apparently he has recovered from his vet visit. I love seeing how happy, content and truly at home he's become in such a short time. 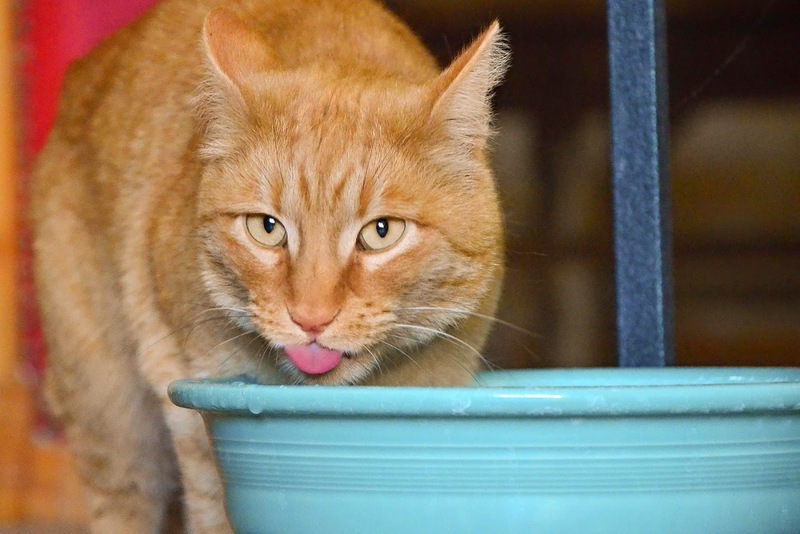 Our cat loves to drink out of the dog bowl, so I don't even put water out for "her" anymore.